Sources are at the core of Webcampak picture acquisition, processing and storage. Before starting to use Webcampak, at least one source needs to be created. 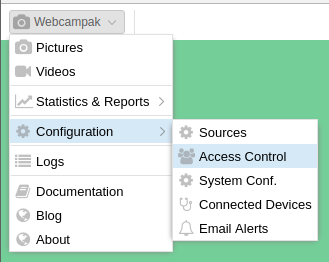 To add a source, navigate to "Webcampak > Configuration > Access Control". The access control window allows users to manage users, groups, customers and sources. Users can add a new source by clicking on "Add". Source ID: A numerical ID used internally to manage the source. This number must be unique but do not have to follow a sequence. For example, the FTP account for the source will be sourceX, with X being this number. Weight: the numerical value used for sorting purposes, the lowest number will be first. This number does not have to be unique, if multiple sources have the same weight, they will be sorted by name. Quota (GB): Quota to be allocated for the source. Used for reporting purposes only, quotas are (on purpose) not enforced on Webcampak. 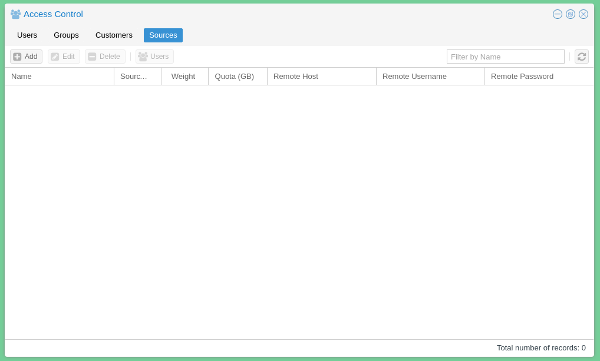 Remote Host: Unused, a placeholder for a future feature. Remote Username: Unused, a placeholder for a future feature. Remote Password: Unused, a placeholder for a future feature. Users can then be assigned to this source, by dragging them from the left side to the right side of the screen. "Alerts", when turned on, will trigger emails sent by the system when there is an alert on this source and to receive daily statistics by email. To configure a source, navigate to "Webcampak > Configuration > Sources". Users are presented with a list of available sources attached to their account. Webcampak does not auto-save configuration changes and will display the status of the configuration (modified, unmodified) in the bottom toolbar. To prevent manipulation issues, users are required to either save or cancel changes before moving to another source. This tab is used to configure all settings directly related to picture acquisition. Activate Source: Activate the source or not, if inactive, no action will be taken (no pictures, no videos). Source Type: Type of picture acquisition mechanism to be processed by the source. Capture Every: Interval at which the source will try to capture a picture. Minimum Interval: Minimum interval between two pictures. This acts more as a safeguard to avoid overloading the system by misconfiguration. Ideally, this number should be set to the longer capture time during the source operation window. Capture Delay: Delay before initiating capture. This is useful for chained sources to avoid processing delays. Picture Date: Select if date attached to the picture should be the script start time or the actual picture acquisition time. Enable Calendar: If disable, the system will capture 24/7, if enabled it will capture at days selected below. Those settings are only used when multiple D-SLR cameras are physically connected to the same Webcampak. Those settings are used when pictures are coming from another Webcampak source (chained sources). Select capture mode: Two modes are available "Get" or "Receive". If "Get", the source will actually try to capture the latest picture from the other source, this mode can only be used for local sources. If "Receive", the source will process pictures uploaded to its /tmp/ directory, this mode is usually used when remote Webcampak are sending their pictures. Select source to get from: Source to get the picture from if "Get" is selected in "Select capture mode". 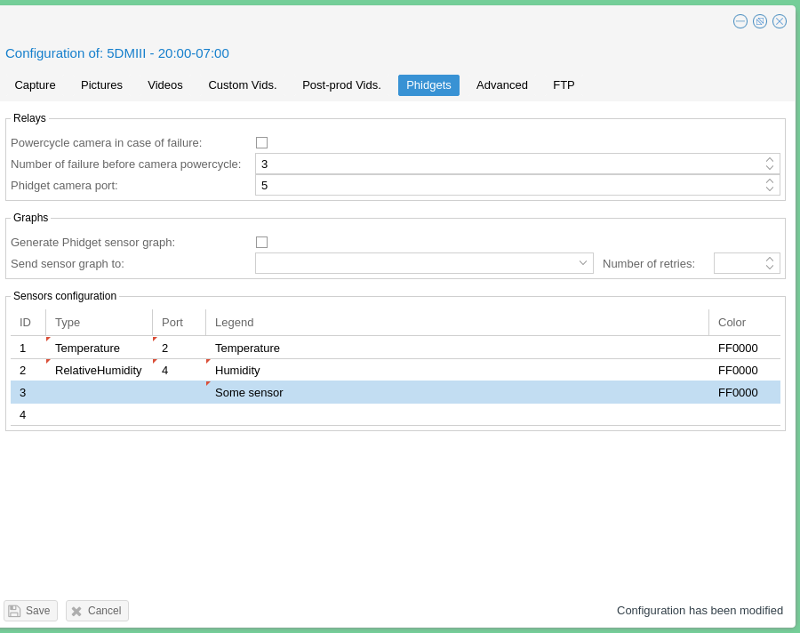 Those settings are used to process pictures uploaded to the /tmp/ directory, whether those are coming from IP Cameras or remote Webcampak. Define picture date based upon: Various methods are available to identify the picture's date. Additional parsers can be added to process more source types. Limit hotlink processing to one picture per rotation: This setting prevent multiple hotlinks to be created is multiple pictures are processed in batch. In this case, only the hotlinks corresponding to the first picture are generated. Take actions if no new pictures in /tmp/ directory: Trigger alerts if no new pictures are available in /tmp/ directory. Those settings are used to process pictures by acquiring a remote image of a video stream. URL File/Stream: URL of the remote resource. This section of the configuration allows you to define manipulations to be applied to pictures right after their capture. Those settings are executed in sequence in the order available in the configuration screen (picture is first rotated, then cropped, etc ...). This option can be used to rotate the picture, clockwise, by a specific angle. Note that this feature is compute-intensive and will impact the duration of the capture process. It should preferably be used on Webcampak cloud or on Webcampak devices with low capture rate. This option can be used to crop the picture to a specific area, this is especially useful if you want to focus on a specific portion of a picture. The system asks you to detail the size of the area (in pixels) and it's start location (in pixels) from the top-left corner of the source picture. This option can be used to insert a watermark into the picture. A watermark can simply be a logo or be a more complex decoration around a picture (such as a specific box for the date, an improved legend, etc...). The global Webcampak /resources/watermark/ directory, shared between all sources. This directory is accessible via FTP through the "wpresources" account (see general configuration). The local source's /resources/watermark/ directory. This directory is accessible via FTP through the source's FTP account (see FTP tab). Transparency (in %) with 0 being fully transparent and 100 being not transparent, can be defined as well as watermark's location from the top-left corner of the picture. This option can be used to insert some text (single line) into the picture, usually a legend. If a date format is specified, it will be appended at the end of the legend's text, following the selected format. Will place the bottom left corner of the text area, to start 11 pixels on the X axis and 10 pixels on the Y axis from the bottom left corner of the picture. Adding a shadow to the legend often makes the text more readable, the shadow is actually the same text, written behind the main text but with a different colour and a slight pixel offset. Note: If more complex static code needs to be added, this can be done through the watermark feature. This option can be used to create "hotlinkable" pictures, those constantly keep the same filename and are automatically replaced as new pictures are being captured. Webcampak can be configured to create 4 of those, which should give enough flexibility to for most use case (thumbnail link, full size, etc...). Users can also choose to "Generate error hotlink", which, in the case of failed capture, will replace the previous picture with an error message embedded in the picture. Save pictures into archives: If unselected, the picture will be deleted at the end of processing. This prevents any videos from being created, and might only be useful in very specific situations where this source is only used as a temporary processing step. In most situations, this should be selected. Minimum single picture size: Minimum size, in bytes, of the picture. If below the system will consider the capture failed. Delete pictures after: Automatically delete older directories after X days. Note that it delete a full day at once, not considering hours. Maximum archive size: Maximum size of the entire pictures, in MB. If over, will delete a full day of pictures at each rotation, starting with the oldest day. This option is used to specify FTP servers to send pictures to. Those servers are defined in the FTP tab. Unless the option is selected, RAW files are not being sent to remote servers. Users can also specify the number of retries, in the case of transmission failure. On top of sending the FTP command to send the picture. Webcampak also compares exact file size (bytes) at the end of the transfer, if files are different, it will consider that transfer failed. This option is used to copy pictures to another source within the webcampak. This section is used to configure videos generated daily (processing starts by default at 1 am) by the system. 4 video definitions (1080p, 720p, 480p, custom) are supported by default, and 2 video formats (H.264 and MP4). Similar to the "Pictures" section, picture manipulation settings are applied in sequence, following the configuration screen order. 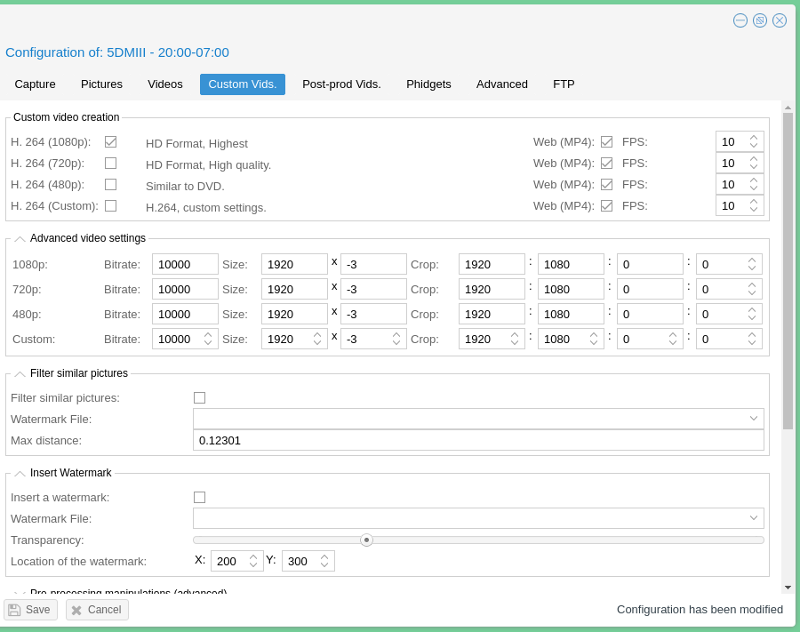 In this section, users can select video definition and formats, and frames per seconds (FPS). Please note that the MP4 file is generated by converted the H.264 file, so MP4 files alone cannot be created, the corresponding H.264 option must be selected. This section offer default configuration for most settings of 1080p, 720p, 480p definitions. Since in a vast majority of situations, source pictures are converted from 4:3 aspect ratio, only the last parameter (Y axis) of the crop is customizable (this is on purpose). The custom parameter lets you personalise all settings. May you have sufficient compute power and memory resources, the system could generate 4K or 8K videos. This system lets you compare the (difference)[https://www.pureftpd.org/project/libpuzzle] between two pictures using (puzzle-diff)[https://linux.die.net/man/8/puzzle-diff]. This difference is represented as a "distance", you will probably have to run a couple of sample videos to identify the best threshold for your video. For greater accuracy, a watermark can be defined, this watermark is applied by Webcampak on each picture before calculating the difference. For example on a construction site, you might want to add a black watermark covering everything which does not deal with the building you are capturing. This way, the difference will only be calculated if something changed on the building itself (not capturing clouds movements for example). The difference is a calculated between two consecutive pictures. For example PIC-1 is compared with PIC-2, if PIC-2 in over the threshold, it's not selected and PIC-1 is compared with PIC-3, then PIC-3 is compared with PIC-4, PIC-4 is compared with PIC-5, and so on. Please note that this can slightly increase video creation runtime depending on the number of calculations to be executed. Please refer to the Watermark section of the pictures tab. This section lets you add a legend to your video (please refer to the text section of the picture tab). It can also be used to resize pictures before video creation (this might have a positive impact on video creation time). Original pictures are not impacted by this setting. 01-Yellow.submarine.mp3 02-Beat.it.mp3 Upload all files (M3U and corresponding MP3) via FTP to /audio/ directory. During the creation of the video, Webcampak will create a playlist.mp3 file, you can use this file for other videos and even rename it for later use. 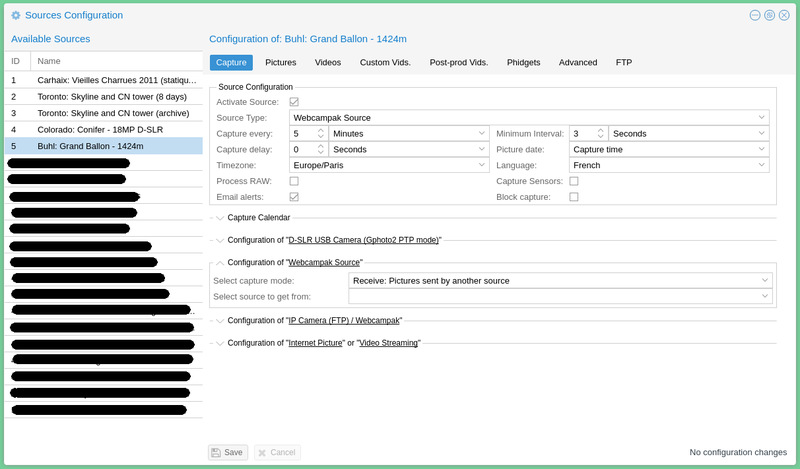 Videos can be uploaded to remote FTP servers defined in the FTP tab. Most settings in this tab are identical to those available in the "Video" tab, we will only focus on custom settings. This section let you configure settings directly related to video creation (which could take hours if creation spans multiple months). Keep pictures between: only use pictures between a specific timeframe (i.e. between 8:00am and 7:00pm) to create the video. Minimum time between two pictures: when preparing your video, Webcampak will check the time between two captures, if lower than this value, the picture will be discarded. This section of the configuration allows users to batch process a large number of pictures. Reduce picture size: cropping/resizing pictures in batch reduces the overall size of pictures to be inserted into a video manipulation software. Advanced picture selection: copying pictures to a dedicated source allows users to delete sequences by still keeping original pictures. Please refer to the "Filter similar pictures" section of the "Custom Vids." tab. Please refer to the "Rotate Picture" section of the "Pictures" tab. Please refer to the "Crop Picture" section of the "Pictures" tab. This section allows users to progressive focus to a specific portion of the picture. It works similarily to "Crop" but instead of applying the effect right away, it will calculate the number of frames between the first picture and last picture, and identify how to progressively modify the pictures to reach the selected coordinates. This section allows users to resize pictures by specifying new dimensions in pixels. By playing with various sizes, this allows users to play with focus area (zoom-in/out). Please refer to the "Insert Watermark" section of the "Pictures" tab. Please refer to the "Insert a legend" section of the "Pictures" tab. This section let you configure settings directly related to starting batch processing (which could take hours if creation spans multiple months). Minimum interval between two pictures: when preparing your video, Webcampak will check the time between two captures, if lower than this value, the picture will be discarded. Move pictures to: select the source you would like your pictures to be moved to. Start creation: you can choose to start video creation as soon as possible or between 4h00 and 5h00 in the morning. Powercycle the camera in case of failure: Option to be selected to activate power-cycling. Number of failure before camera powercycle: How many failed capture before triggering the event. Phidget camera port: Port on the Phidgets board to which the relay is connected. Note that power-cycling will only be triggered when the condition is first met ( the camera will only be power cycled once). Webcampak can generate RRDGraphs out of captured sensor values, enabling this option will make Webcampak refresh its sensor graphs every 5mn. Phidgets graph gets a static name, but changing sensors settings will trigger a new name to be created. Graphs can also be sent to a remote FTP server defined in the "FTP" tab. These sections allow users to configured more advanced parameters, and for now, dealing with email alerts. Time-based alerts are triggered based on total elapsed time since last successful capture. This type of alert do not take into consideration any pre-configured schedule, it simply compares current time with last capture time. At a pre-configured interval, the system will send a reminder about the failed status. Schedule based alerts are triggered based on calculating the number of missed captured since last successful capture. To use this part of the system, users will define in advance the expected weekly capture schedule. Users can also configure a "grace" period, allowing for picture processing or data transfer time. During this grace period, calculated from last expected capture slot, the system will not take in consideration any possible failed capture. For example, if the system expects a capture at 5:10 and the grace period is set to 5 mn, the system will only send an alert if the 5:10 picture is still missing at 5:15. 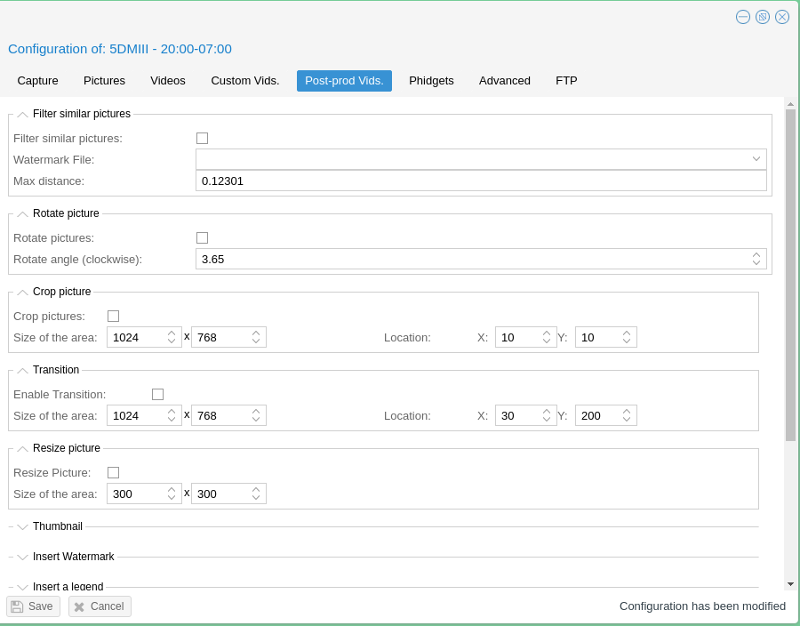 This section of the configuration lets the user configure local FTP credentials as well as list all remote FTP servers they would like to use. Each Webcampak has its own internal FTP server, you can use those credentials to connect directly to the source, to download or delete content, or to configure another source to send pictures to this particular source. A password is generated automatically at source creation, you can change it at any time.